In this chapter, we focus on public information broadcasting as an important component of a smart city. To broadcast information, we propose to install miniature and very cheap access points in public places in a smart city, capable to interact with mobile personal devices according to the bring your own device (BYOD) idea, in ad hoc and anonymous mode, by means of Bluetooth connection. The broadcasted information is automatically adjusted to the specificity of a given time/place, limiting the need for further processing at the user side. The proposal is not a competitor to current solutions, such as generic mobile applications providing city services based on geo-location. It is rather a natural supplement and extension to the already existing intelligent transportation systems. According to the idea “right information at the right place and the right time,” the proposed system provides the information well suited for the place of its access, as well as minimizes the efforts related to parameterized access and personalized filtering. Bring Your Own Device BYOD idea. (2014). Gartner, Inc. http://www.gartner.com/technology/topics/byod.jsp. Accessed March 2014. High Speed Uplink/Downlink Packet Access. (2014). 3GPP Global Initiative portal. http://www.3gpp.org/HSPA. Accessed March 2014. Intelligent Transport Systems. (2014). http://www.etsi.org/technologies-clusters/technologies/intelligent-transport. Accessed March 2014. Munich COMFORT—cooperative transport management for Munich and its surrounding area. (2014). http://www.mobinet.de/Fachinformation/pdf/mc_e.pdf. Accessed March 2014. Raspberry Pi—Quick Start Guide. (2014). Raspberry Pi Foundation. http://www.raspberrypi.org/quick-start-guide. Accessed March 2014. Regensburg „RegLog®—City-Logistik“. (2014). http://www.werkstatt-stadt.de/en/projects/8/. Accessed March 2014. Smarter cities: Infrastructure. Operations. People. (2014). IBM project “Smart Cities”. http://www.ibm.com/smarterplanet/us/en/smarter_cities/overview/. Accessed March 2014. The Traffic Message Channel (TMC). (2014). http://www.tmcforum.com/technologies/tmc/. Accessed March 2014. What is Bluetooth technology? (2014). http://www.bluetooth.com/Pages/what-is-bluetooth-technology.aspx. Accessed March 2014. What is GPS? System Overview. (2014). http://www.gps.gov/systems/gps/. Accessed March 2014. When People Meet Machines to Build a Smarter Society. (2014). Smart society project. http://smart.inf.ed.ac.uk/. Accessed March 2014. Why Smart cities? 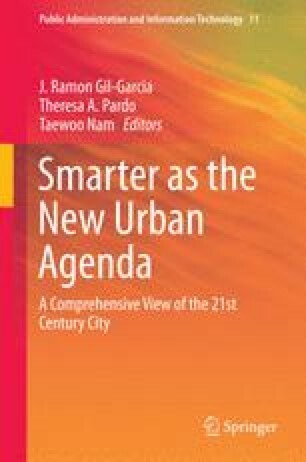 Comprehensive study on intelligent solutions provided in small- and medium-size cities across Europe. (2014). Smart Cities Programme—Vienna University of Technology, OTB Research Institute for Housing, Delft University of Technology, University of Ljubljana. http://www.smart-cities.eu/why-smart-cities.html. Accessed March 2014.